I enjoy trialling new crops, and this season one of the most outstanding plants at ‘Bellis’ has been the West Indian gherkin, Cucumis anguria. This trial had a shaky start, with only one seed germinating from the packet I bought from Eden seeds. I gave it well composted, freely draining soil in a raised bed in a sunny position. Sown on 24th October, I planted my seedling in December. I attempted to tame this scrambling vine by training it up a bamboo wigwam. It looked fine, neatly tied in place with jute twine, but it kept spilling downwards. I decided to let nature take its course, and it formed a groundcover, starting to flower in January. By the beginning of February it had completely colonised the adjacent 10 square metre vegetable bed, and produced its first prickly fruit. You’ll need to wear gloves when handling this plant, because the hairs can penetrate skin. 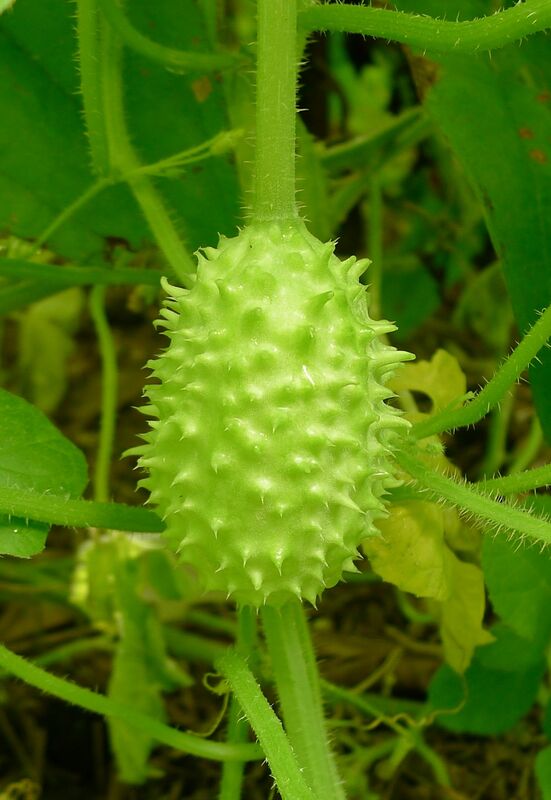 The fruit have slightly coarser prickles. By using a pair of scissors (or sharp secateurs) it’s possible to remove individual fruit, and by using either gloves, or the scissors, you can pick them up by the stalk and place them in a basket without getting prickled. One trick to eating them without getting prickled is to place a fruit into a tea towel and then to rub them all over. This neatly removes the prickles. Fruit must be picked regularly. If you don’t, they put all their energy into seed production and plants die younger. 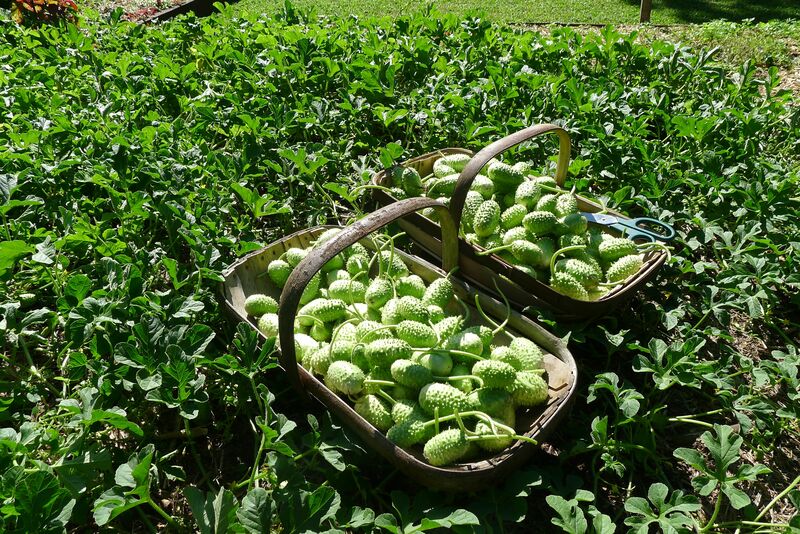 Picking encourages further fruiting and a bigger harvest. Young fruit can be eaten whole, and taste very sweet. But leave them on the vine for two or three days too long and their skin becomes a bit tough and the seed harden, making them less pleasant eating. Between February and April this single plant produced almost ten kilos of fruit, and productivity increased during autumn. On 21st April I picked 8.4 kg, on 9.5.12 it was 2.09kg, and on 13.5.12 I picked 4kg to give away to visitors at the Open Day. The final picking was on 23rd May, when I removed the vine for composting, and that yielded 6.2kg fruit. Mum can’t remember Nan’s recipe for making pickling vinegar, but we do remember what she put in it, so I’ve added 3 tsp sugar, 6 peppercorns, and 6 cloves to 400ml malt vinegar. Caution: Seedlings are toxic. 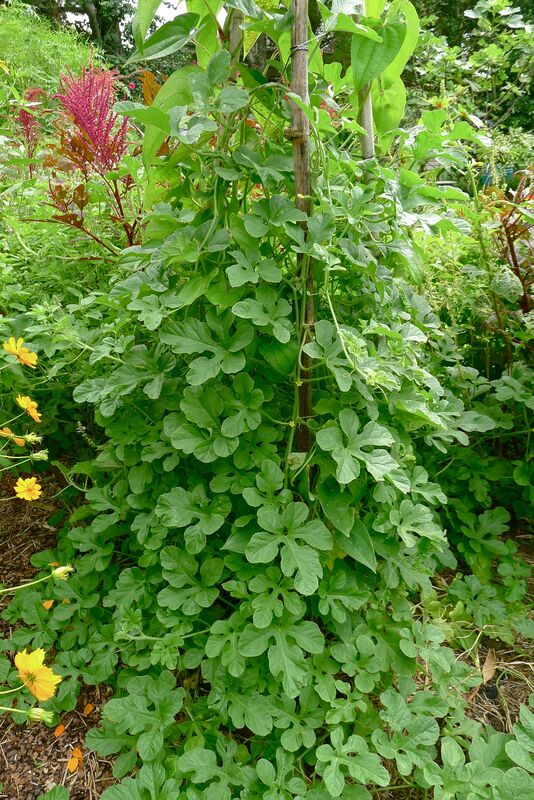 This is a natural pest-repellant plant! A mystery plant. 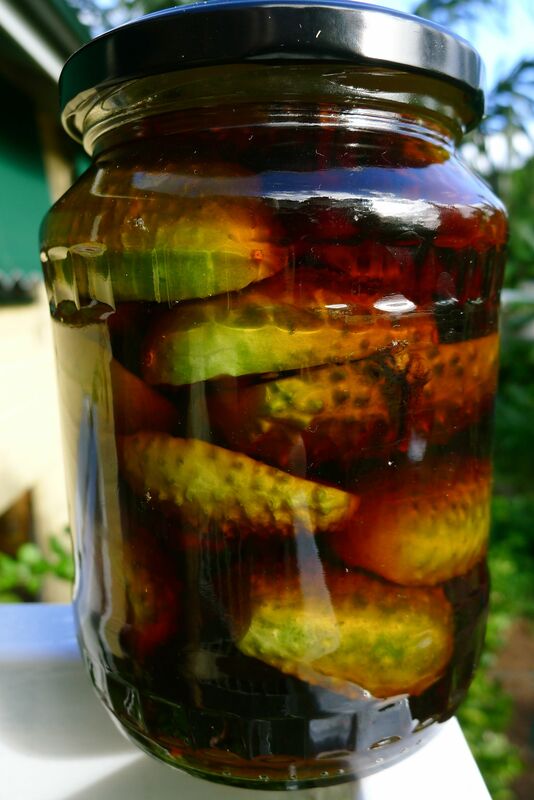 Also known as maxixe, badunga, cohombroly, prickly cucumber, and burr gherkin, the West Indian gherkin probably originated in tropical America, but it has never been observed growing in the wild. I acquired mine from Eden Seeds. Thanks for that awesome tip. We will add this one to our list. Is it worthwhile sowing this now? Or should we wait until after winter? (We’re at 4208, subtropical SE Qld). I don’t recall having had any real frost since we’ve been here. With hindsight I would sow them a fortnight before the longest day of the year. This is a day length responsive tropical species. Many heavily bred crops (modern peas vs heritage peas for example) have become day length neutral, in other words they just grow, flower and crop irrespective of increasing or decreasing day length. 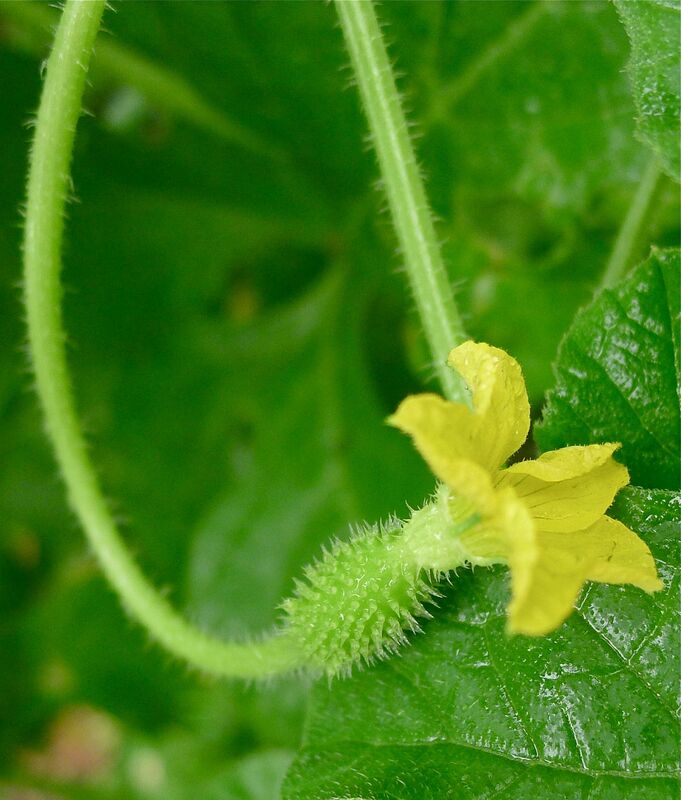 Decreasing day length initiates heavy flowering and fruiting of this gherkin. My plant wasted time, it just trod water so to speak, doing little until after the longest day had passed.